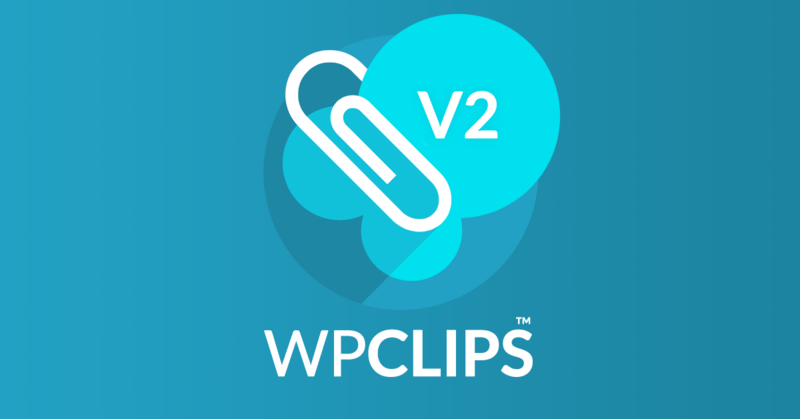 It’s been nearly 12 months since WP Clips was released, and during that time the plugin has undergone several evolutions including the addition of Precoded Clip capability with WP Clips Plus, multisite compatibility with WP Clips Multisite, and the introduction of ClipBank™ as a helpful resource for sharing and downloading Precoded Clips. The uptake of the product has grown dramatically in the last 3 – 6 months and so has the feedback. Mostly complimentary, but some critical. I always welcome critical feedback because it offers an opportunity for evolution and improvement. And so, I proudly announce the release of WP Clips Version 2. The first thing you’ll notice is that WP Clips Plus has now been deleted. Precoded Clips capability is now built into the WP Clips plugin by default. The decision to merge the two products was based on feedback from new users who would download the basic plugin and then immediately upgrade to Plus to enable Precoded Clips. Great for download stats but not so good for frown lines. So, double-install frustrations be gone! The custom Clip now has a vitals.php file for declaring compatible themes and required plugins. Similar to precoded Clips, conditions can be set to dictate whether the custom Clip should or should not be enabled. This is a helpful feature to prevent site irregularities and errors when switching between themes or deactivating dependent plugins. It’s a development inspired by the Great Update Debate for Genesis child themes, and more particularly the assertion that customizer plugins can be risky for the above reasons. Problem solved. A new addition to WP Clips is the core Clip, which includes a single core-functions.php file. It’s the equivalent of a core-functionality plugin and is used specifically for adding WordPress core functions. Like the custom Clip, the core Clip can be unclipped (i.e. disabled), but otherwise remains active irrespective of themes, plugins or any other conditions. WP Clips Multisite continues with no major changes other than the network Clip is now the core Clip. Many general code improvements have been made to ensure a leaner, faster and more secure plugin. Precoded Clip update prompts have also been deemed unnecessary and now been removed. If you’re an existing user of WP Clips, WP Clips Plus or WP Clips Multisite, updating is easy! All new file additions and filename changes are automatically implemented on install of the new plugin (providing you are logged into admin). Visit the Updating or Upgrading page on the WP Clips website, download the plugin and follow the instructions provided. Note: WP Clips Plus users should upgrade to WP Clips (strange as it sounds). Jon has worked in a variety of creative disciplines over 25 years, including 17 years at the helm of Zynke Design, one of Australia’s most established design studios. He’s been credited on several films, is a qualified strategic intervention coach, and now lives and breathes WordPress, Genesis and WP Clips!